To some, failure is a step backward / drawback, while to others Failure is another step close to achieving success. Nobody is a failure till he / she concedes defeat and accept that he / she has failed, failing at something doesn’t mean you didn’t prepare well neither does it mean you are not good enough rather it means you still have somethings to do before you achieve your desired goal. 1) Quit and accept you failed. 2) Blame it on the environment and every other thing around you. 3) Start your preparations again and be determined not to make the same mistakes you made when you failed. Failing at something means you’ll be either a day/ week/ month wiser and knowledgeable than you were the last time you attempted it. The only different between success and failure is the zeal, the determination not to quit and the spirit to be better than you were. The successful people in the world today are those that have failed at something several times over but what separates them from others is the fighting spirit not to give up and the enthusiasm to fight on till they win. To a determined man the word ‘END” means ‘EFFORT NEVER DIES”, but to a weak man it means the end of trying and in the same vein ‘NO” to a determined man means ‘NEXT OPPORTUNITY” but a weak man will stop making attempts and accept failure. Failure is as natural as success is. The word failure needs to be re-classified. Instead of using the word failure, we should use ‘err’ in its place. Failing at a task is simply getting it wrong or possibly not getting it right. Nothing substantial in life will ever be achieved if failure was the end of the road. Life is full of trials and errors and without trials there can be no errors, and without trials and its all encompassing errors, success simply will not be achievable. Errors are the one ingredient we all need. It is precisely these errors that show us the way things should not be done. This is called learning. Solutions to problems are born out of failure. Failure only becomes real when you lie down and give up. Always endeavor to keep trying, keep attempting and never relent, attempt it not till you get it right but till you can’t get it wrong because failure is how you define it to yourself and how you view it. Failure is not a sin – it is a just another way of attaining success. 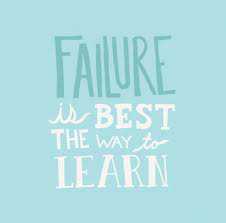 “Failure is the best form of education known to mankind. The more you fail – the more you learn. The more you learn – the better educated you are, The better educated you are – the greater the chance is of success.